Vermont Public Radio has been honored with six regional Edward R. Murrow Awards from the Radio, Television Digital News Association. VPR received awards in the following categories: breaking news coverage, hard news reporting, documentary, writing, website, and overall excellence. The Radio, Television, Digital News Association has honored outstanding achievements in electronic journalism with the Edward R. Murrow Awards since 1971. 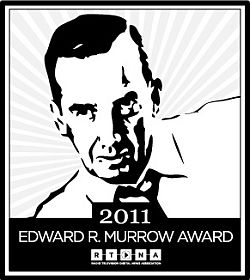 Murrow’s pursuit of excellence in journalism embodies the spirit of the awards that carry his name. The regional awards are selected from nominations at public and commercial radio stations in the New England states. newscast, special series samples and commentaries. Click on the "Listen" link above to hear the actual award winning entry. Here are the complete individual stories that were part of the Overall Excellence entry. Voices From The Trail: "Live Strong"